Conversely, CDHP plan costs have risen 2 percent from last year, according to UBA. So while they are still 3.5 percent less costly than the average plan, they offered more savings in 2015 when they were 5.6 percent less than the average plan. The UBA survey finds that 25.7 percent of plans offered by employers are CDHPs, a 14.2 percent increase in the last five years. Regionally, however, there are major differences in CDHP popularity. CDHPs have increased in prevalence in all regions except the West, which saw the number of these plans decrease by 7.2 percent from 2015. Despite this decrease in the number of CDHPs offered in the West, there was an 18.9 percent increase in the number of employees enrolled, indicating the continued attraction to the lower premiums of such plans. While most of the country is experiencing slightly increased premiums, California has enjoyed an 11.4 percent decrease in average single premiums, finds UBA. Employers in this part of the country are actually moving away from CDHPs and toward HMOs, which the survey shows are 9 percent less costly than the average plan. 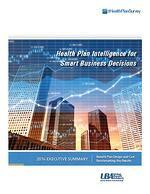 UBA’s 2016 Health Plan Survey Executive Summary is available now at http://bit.ly/UBAsurvey or it can be downloaded directly at http://bit.ly/2016-executive-summary. For interviews, contact Carina Sammartino, Media Relations, csammartino (at) fishervista.com or 760-331-3547.